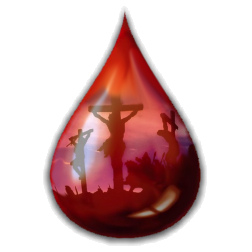 On Wings of Eagles: A Different Look at Christ's Blood Shed for us. This is a great story I ran across. It really puts things into perceptive. As we head toward Easter take the time to remember what God did for us. The day is over, you are driving home. You tune in your radio. You hear a little blurb about a little village in India where some villagers have died suddenly, strangely, of a flu that has never been seen before. It's not influenza, but three or four fellows are dead, and it's kind of interesting. They're sending some doctors over there to investigate it. You don't think much about it, but on Sunday, coming home from church, you hear another radio spot. Only they say it's not three villagers, it's 30,000 villagers in the back hills of this particular area of India, and it's on TV that night. CNN runs a little blurb; people are heading there from the disease center in Atlanta because this disease strain has never been seen before. By Monday morning when you get up, it's the lead story. For it's not just India; it's Pakistan, Afghanistan, Iran, and before you know it, you're hearing this story everywhere and they have coined it now as "the mystery flu." The president has made some comment that he and everyone are praying and hoping that all will go well over there. But everyone is wondering, "How are we going to contain it?" That's when the President of France makes an announcement that shocks Europe. He is closing their borders. No flights from India, Pakistan, or any of the countries where this thing has been seen. That night you are watching a little bit of CNN before going to bed. Your jaw hits your chest when a weeping woman is translated from a French news program into English: "There's a man lying in a hospital in Paris dying of the mystery flu." It has come to Europe. Panic strikes. As best they can tell, once you get it, you have a week and you don't know it. Then you have four days of unbelievable symptoms. Then you die. Britain closes it's borders, but it's too late. South Hampton, Liverpool, North Hampton, and it's Tuesday morning when the President of the United States makes the following announcement: "Due to a national security risk, all flights to and from Europe and Asia have been cancelled. If your loved ones are overseas, I'm sorry, they cannot come back until we find a cure for this thing. Within four days our nation has been plunged into an unbelievable fear. People are selling little masks for your face. People are talking about what if it comes to this country, and preachers on Tuesday are saying, "It's the Scourge of God." It's Wednesday night and you are at a church prayer meeting when somebody runs in from the parking lot and says, "Turn on a radio, turn on a radio." While the church listens to a little transistor radio with a microphone stuck up to it, the announcement is made. "Two women are lying in a Long Island hospital dying from the mystery flu." Within hours it seems, this thing just sweeps across the country. People are working around the clock trying to find an antidote. Nothing is working. California, Oregon, Arizona, Florida, Massachusetts. It's as though it's just sweeping in from the borders. Then, all of a sudden the news comes out. The code has been broken. A cure can be found. A vaccine can be made. It's going to take the blood of somebody who hasn't been infected, and so, sure enough, all through the Midwest, through all those channels of emergency broadcasting, everyone is asked to do one simple thing: "Go to your downtown hospital and have your blood taken. That's all we ask of you. When you hear the sirens go off in your neighborhood, please make your way quickly, quietly, and safely to the hospitals." Sure enough, when you and your family get down there late on that Friday night, there is a long line, and they've got nurses and doctors coming out and pricking fingers and taking blood and putting labels on it. Your wife and your kids are out there, and they take your blood type and they say, "Wait here in the parking lot and if we call your name, you can be dismissed and go home." You stand around scared with your neighbors, wondering what in the world is going on, and that this is the end of the world. Suddenly a young man comes running out of the hospital screaming. He's yelling a name and waving a clipboard. What? He yells it again! And your son tugs on your jacket and says, "Daddy, that's me." Before you know it, they have grabbed your boy. "Wait a minute, hold it!" And they say "It's OK, his blood is clean. His blood is pure. We want to make sure he doesn't have the disease. We think he has got the right type." Five tense minutes later, out come the doctors and nurses, crying and hugging one another -- some even laughing. It's the first time you have seen anybody laugh in a week, and an old doctor walks up to you and says, "Thank you sir. Your son's blood type is perfect. It's clean, it's pure, and we can make the vaccine." As the word begins to spread all across that parking lot full of folks, people are screaming and praying and laughing and crying. But then the gray haired doctor pulls you and your wife aside and says, "May we see you for a moment? We didn't realize that the donor would be a minor......we need you to sign a consent form." You begin to sign and then you see that the number of pints of blood to be taken is empty. "H-h-h-how many pints?" And this is when the old doctor's smile fades and he says, "We had no idea it would be a little child. We weren't prepared. We need it all!" "But - but....."
"You don't understand. We are talking about the world here. Please sign. We-we need it all -- we need it all!" "But can you give him a transfusion?" "If we had clean blood we would. Can you sign? Would you sign?" In numb silence you do. Then they say, "Would you like to have a moment with him before we begin?" Can you walk back? can you walk back to that room where he sits on a table saying, "Daddy? Mommy? What's going on?" Can you take his hands and say, "Son, your mommy and I love you, and we would never ever let anything happen to you that didn't just have to be. Do you understand that?" And when that old doctor comes back in and says, "I'm sorry, we've -- we've got to get started. People all over the world are dying." Can you leave? Can you walk out while he is saying, "Dad? Mom? Dad? Why - why have you forsaken me?" And then next week, when they have the ceremony to honor your son, and some folks sleep through it, and some folks don't even come because they go the lake, and some folks come with a pretentious smile and just pretend to care. Would you want to jump up and say, "MY SON DIED! DON'T YOU CARE?" Is that what God is saying? "MY SON DIED. DON'T YOU KNOW HOW MUCH I CARE." Dear Lord as we think about how you see it, it breaks our heart. We pray that we would comprehend the great love you have for us. In Jesus’ name, Amen.